Deep Learning is mainly a subfield of machine learning concerned with algorithms inspired by the structure and function of the brain called artificial neural networks. Deep learning is one of the aspect of artificial intelligence (AI) that is concerned with emulating the learning approach that human beings use to gain certain types of knowledge. In simple terms, Deep Learning can be thought of as a way to automate predictive analytics. Deep learning online test helps hiring managers & recruiters to find the best suitable candidate by assessing his/her ability to work on Deep Neural Network models. Deep learning assessment test questions are designed & validated by industry experts to assess & hire deep learning engineer as per the industry standards. Deep learning assessment test contains the latest & quality set of scenario-based questions to assess the operating experience of the candidate. Moreover, you can add your own questions as per the job requirement. Deep learning skills test will evaluate the candidate's practical knowledge and will identify whether the candidate is ready to be employed. Deep learning pre-employment test may contain MCQ's (Multiple Choice Questions), MAQ's (Multiple Answer Questions), Fill in the Blanks, Descriptive, Whiteboard Questions, Audio / Video Questions, LogicBox (AI-based Pseudo-Coding Platform), Coding Simulations, True or False Questions, etc. Q 1. Your boss told you that you need to do sentiment analysis using Convolutional Neural Networks. Knowing that Convolutional Neural Networks are well-known for good performance in images, how will you react? You can't use Convolutional Neural Networks for Natural Language Processing. That's totally wrong. Recurrent Neural Networks are better to use for this. Q 2. 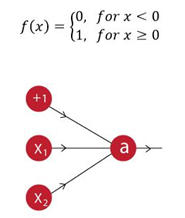 Suppose you were given a neural network architecture shown in the image and its activation function. What would be the weights and bias if you would want to implement an AND function?